Another great win for the Giants last night, I’m sure the whole city is going crazy! 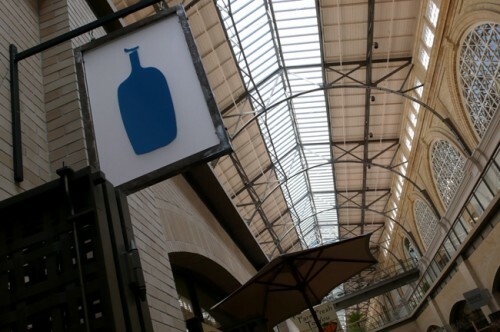 I so wish I were there to witness everything and feel the energy… but before I do anything, I would stop by the Blue Bottle Coffee first. 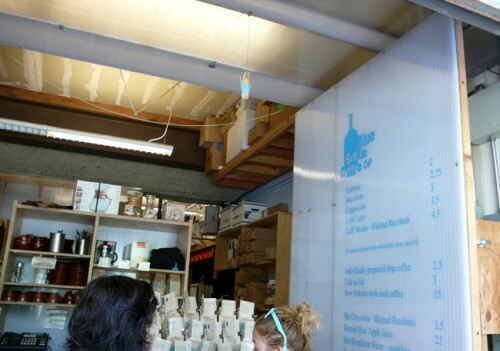 That’s exactly what we did when we landed in San Francisco this July — straight to the Blue Bottle! I always love their logo and the store signs, too. 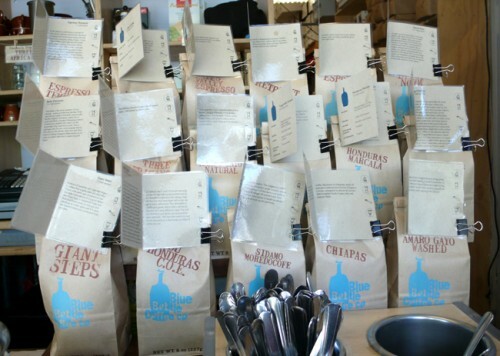 Lots of different kinds of beans… I like their packaging, too. Each name is hand stamped and the logo might be hand stamped as well. and look what I found! 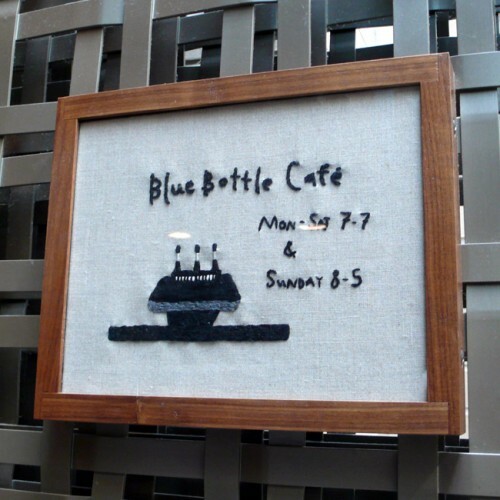 An embroidery café sign :) I thought it was so cute I had to take photos! And I still love my cup of Blue Bottle every morning here in NY. Life is good. Happy Friday! 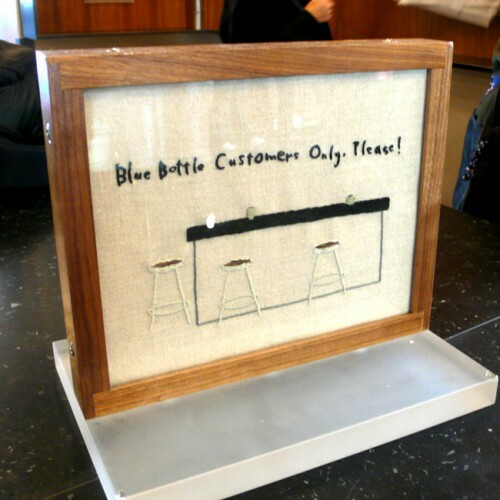 This entry was posted in SF and tagged blue bottle coffee, coffee, embroidery, ferry building, kiosk, logo design, store sign by Hijiri. Bookmark the permalink. I love this place! And go Giants!!! :) SF is electric right now! 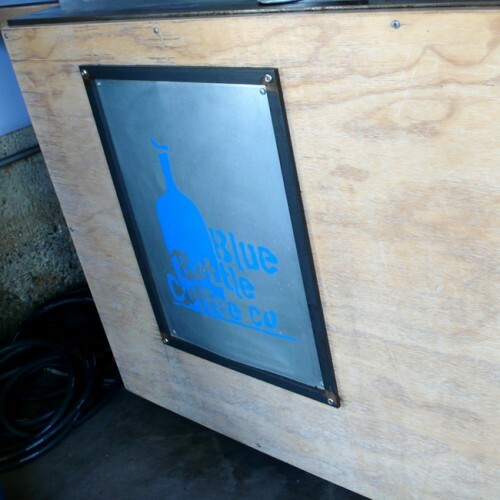 I had my first cup of Blue Bottle when I was in SF a couple of weekends ago. We enjoyed iced New Orleans style coffee from the Ferry Building farmers’ market stall. SO GOOD! :) I bet it is!! !